St. Martin's Griffin, 9781250182005, 288pp. In Geek Girl Rising, Heather Cabot and Samantha Walravens invite women everywhere to join the digital revolution and create the future! Meet the women who aren’t asking permission from Silicon Valley to chase their dreams. They are going for it—building cutting-edge tech startups, investing in each other’s ventures, crushing male hacker stereotypes and rallying the next generation of women in tech. 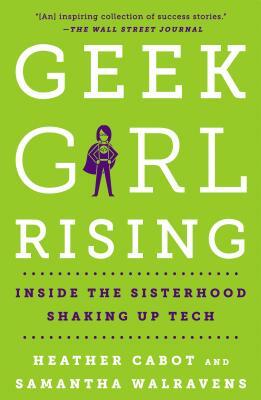 With a nod to tech trailblazers like Sheryl Sandberg and Marissa Mayer, Geek Girl Rising introduces readers to the fearless female founders, technologists, and innovators fighting at a grassroots level for an ownership stake in the revolution that’s changing the way we live, work and connect. Readers will meet Debbie Sterling, inventor of GoldieBlox, the first engineering toy for girls, which topples the notion that only boys can build; peek inside the glamorous world of YouTube pioneer Michelle Phan; and tour the headquarters of The Muse, the hottest career site for millennials, led by intrepid co-founder and CEO, Kathryn Minshew. Amid the rising chorus of women speaking out against sexism in technology, media, entertainment and politics, Geek Girl Rising’s message of female solidarity and empowerment is more urgent than ever. Now in paperback, with a new afterword that takes readers inside 2017’s national conversation on sexual harassment, the #MeToo movement, and what’s ahead for women in tech. HEATHER CABOT is an award-winning journalist, adjunct professor at Columbia University Graduate School of Journalism, angel investor and contributor to Women@Forbes. She is a former ABC News correspondent and anchor of World News Now/World News This Morning. Cabot jumped into the digital revolution when she was hired to serve as the Web Life Editor for Yahoo! in 2007. During her tenure, she reported on how the Internet was transforming everyday lives as a regular guest on Today, GMA, CNN, MSNBC, Fox, nationally syndicated talk shows and dozens of local TV and radio stations across the U.S. and Canada. She advises several women-led startups and is a managing director of Golden Seeds and member of Pipeline Angels and Plum Alley. Cabot first started investigating the gender gap in tech as a researcher on the 1995 PBS documentary “Minerva’s Machine: Women and Computing,” which profiled female tech pioneers, including U.S. Navy Rear Admiral Grace Hopper. Cabot resides in the New York City area with her husband, tween twins and their goldendoodle named Midnight. SAMANTHA WALRAVENS is an award-winning journalist, work-life expert and author/editor of the best-selling anthology, TORN: True Stories of Kids, Career & the Conflict of Modern Motherhood, lauded by the New York Times as a book "filled with the voices of women trying to solve an impossible equation, all doing the best they can" and hailed by the Los Angeles Times as "a welcome addition to the body of work of books about the work/life balance." Samantha writes for Women@Forbes, the Huffington Post, Disney Interactive and Modern Mom, and is a sought-after speaker on the topic of women, career and work-life success. She has spoken nationwide at organizations including Google, Goldman Sachs, UBS, Deloitte, Princeton University and the Society of Women Engineers, has been interviewed on Today, Good Morning America and NPR. Samantha began her career as a technology reporter for PC World magazine and led marketing communications for Tumbleweed Software, a Silicon Valley software security company. She is a member of Pipeline Angels, an angel network that invests in early-stage, women-led startups, and serves on the Alumni Schools Committee for Princeton University. Samantha resides in Marin County, California with her husband and four children. “Change is finally coming to the tech world because Silicon Valley sisters are doing it for themselves. And Geek Girl Rising proves it. Essential and hopeful reading both for women—and men—who are working or want to work in the digital space. It’s been an uphill battle for women in Palo Alto, but, as Heather Cabot and Samantha Walravens meticulously report, their voices are starting to be heard, and as the data shows, everybody benefits.” —Joanna Coles, Chief Content Officer, Hearst Magazines, and Board Director, Snap Inc.